Transitional helmet for the Army (Heer). 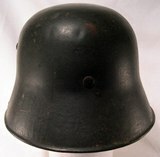 Absolutely not common german helmet, called "transitional", for the Army (Heer). In this case it is, in fact, an Austrian pattern 1916 reconditioned in 1940 as it can be understood easily by the field grey color (feldgrau), by the iron liner and by the "single decal". The helmet, numbered in the inner brim, is outside in very good conditions and the decal is present at the 80%. Internally the helmet has a nice patina of time. One of the hungers for the chinstrap is broken. Rare object itended for an "advanced" helmets collector. Notify me of updates to Transitional helmet for the Army (Heer).